Swami Ken, a native of Minnesota and as warm-hearted a human-being can be! He will be here at Wind over Fire holding a one-hour meditation and then a satsang. If you have not been initiated into meditation Swami Ken will do this for all attendees before he begins the meditation. After meditation there will be Prasad, which is an offering of food that has been blessed by the divine by the meditation and then Swami Ken will hold a satsang. What is a satsang? 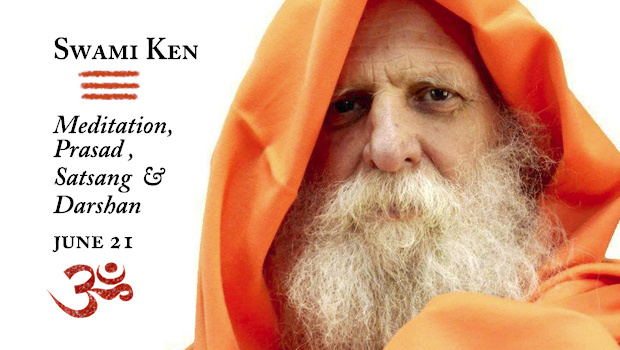 It is being in the presence of a guru that speaks “the truth.” Swami Ken will speak to us (often times as a message he receives from his meditation). Swami Ken’s messages are always profound and insightful and meditating with him is always easy even for the novice! What is darshan? Darshan is ultimately difficult to define, since it is an event in consciousness—an interaction in presence between devotee and God/guru – So basically you sit privately with Swami Ken and ask for prayers/guidance/clarity/healing/ whatever you need and he will also give you his blessing. I have seen many people come to him for healing and have received these gifts from the divine through him! This is a great opportunity for everyone!